Funko Elvis Presley Blue Hawaii Wacky Wobblers bobble head - Mahalo! 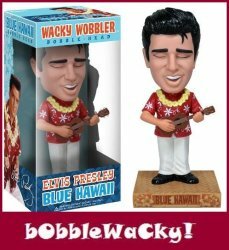 MyMovieMonsters.com > Bobbles-Vinyl > Funko > Wacky Wobblers Bobble-Heads > Funko Elvis Presley Blue Hawaii Wacky Wobblers bobble head - Mahalo! Chad Gates (Elvis) has just gotten out of the Army and is happy to be back in Hawaii with his surf-board, his beach buddies, and his girlfriend. His father wants him to go to work at the Great Southern Hawaiian Fruit Company, but Chad is reluctant. So Chad goes to work as a tour guide at his girlfriend's agency. Okay, not the greatest story line, but it's Elvis ... c'mon. Vinyl figure stands about 7" tall. Collect all the Rock Legends and other Funko products!